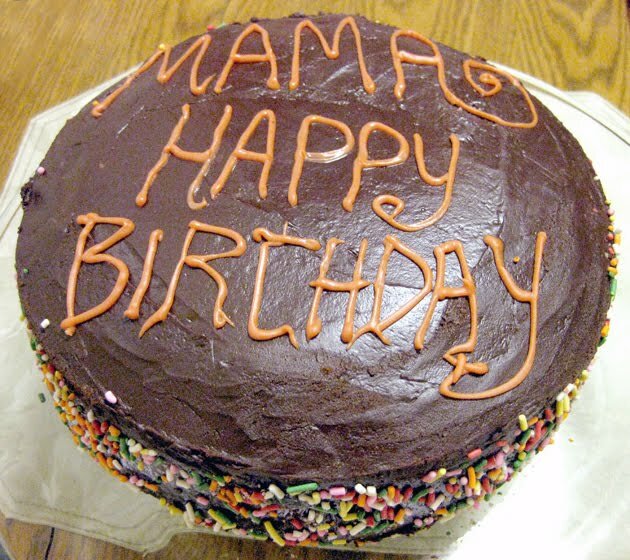 It was Mom's birthday this past weekend and of course I baked her a cake. Not just any 'ol cake, but a cake reminiscent of her birth place. Mom was born in Northern Italy, close to Austria. There is a famous cake called the "Sachertorte" that is a specialty in this region. 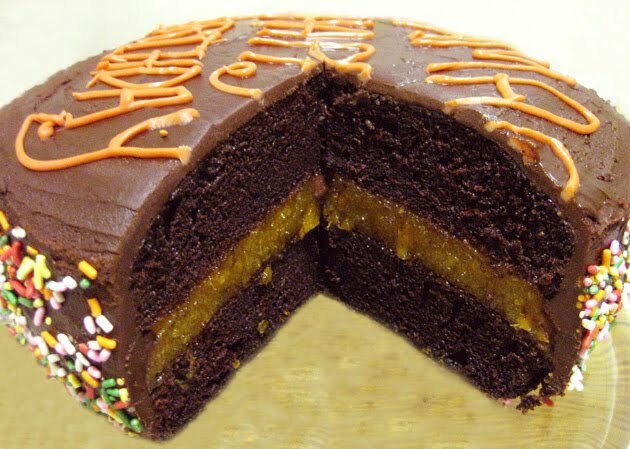 It is a velvety rich chocolate cake with a thin apricot filling and covered in a chocolate ganache. The original cake was created in Vienna, Austria and the only other place in the world that offers the original cake besides Vienna and Salzberg, is in Bolzano, Italy which is located in northern Italy. The cake I made is VERY loosely based on this idea. 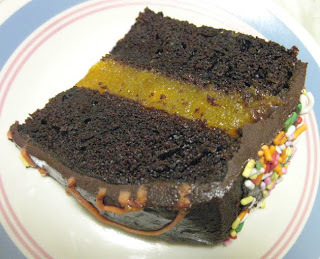 The original sachertorte is much more dense and I used a much thicker apricot filling. I also opted for a creamy chocolate frosting that my mom has been making for years. I found a great chocolate cake recipe on Epicurious.com. It turned out very moist and delicious! * If you do not have buttermilk on hand, substitute 3/4 cup minus 1 tablespoon milk and 1 tablespoon lemon juice or vinegar. Mix together and let stand 5-10 minutes. I used lactose-free milk and it turned out great! Position rack to middle of oven; preheat to 350°F. Coat two 9-inch-diameter cake pans with 2-inch-high sides with nonstick spray. Line bottoms with parchment paper rounds; spray rounds. Sift flour, cocoa powder, baking soda, and salt into large bowl; add sugar and whisk to blend. Form a well in the center. Whisk 1 cup water, buttermilk, oil, and eggs in medium bowl to blend. Pour wet ingredients into well in dry ingredients; beat with hand mixer just to blend. Divide cake batter between prepared pans (about 3 cups each). Bake cakes until tester inserted into center comes out clean, about 30 minutes, turning pans halfway through baking. A great tip from Cindy Mushet: (If cakes form domes, place kitchen towel atop hot cakes, then press gently with palm of hand to level.) Cool completely in pans on cooling racks. Cake can be made 1 day ahead. Cover cakes in pans and let stand at room temperature. Line a 9 inch cake pan with plastic wrap, overlapping on all sides. Add the sliced apricots if using. Set aside. Add the apricot jam to a microwave safe bowl and heat for about 1 minute or until the jam starts to bubble. Add the gelatin and stir until the gelatin is completely dissolved, about 5 minutes. Pour jam mixture into prepared pan and refrigerate until firm, about 3 hours. Place 1 layer of cake, flat side down, inside the cake pan containing the filling. Carefully place a plate over the top of the cake pan; gently and quickly flip over so that the cake and the filling is centered on the plate. Remove plastic wrap. With a knife, carefully trim the edges of the filling that overhang the cake. Place the second cake layer on top, rounded side up, and spread the frosting evenly on the top and sides of the cake. Decorate as desired. Melt butter. Stir in cocoa. Alternately add powdered sugar and milk, until creamy and spreadable. Adding small amounts of additional milk, if needed. Stir in vanilla. WOW, that looks sooo delicious!! 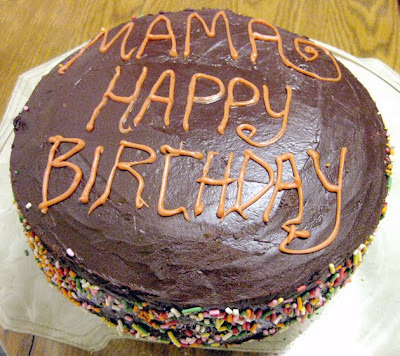 Lucky Mama to have you bake such a sweet surprise dear to her heart. Happy Birthday!! And also - I changed my blog name from City Girl Lifestyle to City|Life|Eats but it's still me. I made this cake for the large corporate law firm at which I work in England. "Delicious", "delightful" and "one of the best cakes I've ever tasted" were a selection of the comments. Thanks!